I have a feature article coming out in the next issue of Presidential Studies Quarterly. I’m very happy with the journal. The editorial staff was professional, the peer reviewers were prompt, and the journal has an interdisciplinary audience of both political scientists and historians. You’ll have to ask your library to subscribe to the journal to get full access to the article, but I’ll tease the first page below. President John F. Kennedy launched the most successful censorship campaign of the past half century. Its target was the Radio Right, an informal network of conservative broadcasters who reached millions of listeners across the country by the early 1960s. With Kennedy’s encouragement, the Internal Revenue Service audited conservative broadcasters to impair their ability to raise money while the Federal Communications Commission discouraged radio stations from airing their programs. 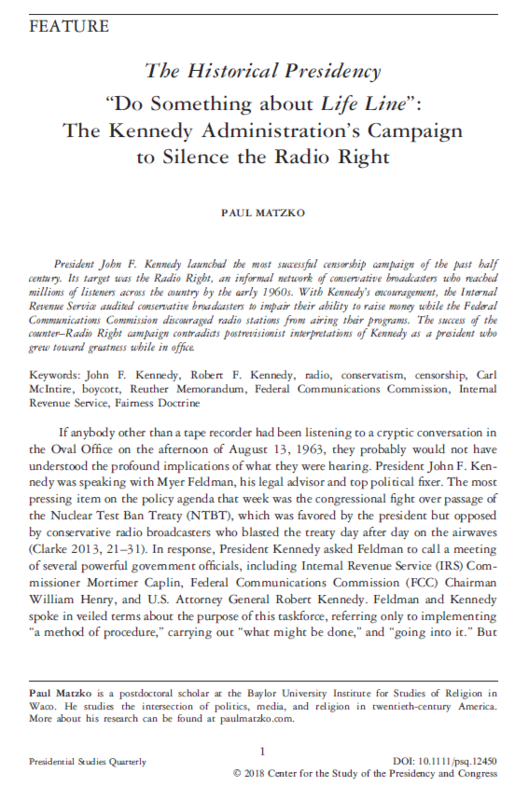 The success of the counter-Radio Right campaign contradicts postrevisionist interpretations of Kennedy as a president who grew toward greatness while in office.